Disabled Navy veteran Raymond Schwab moved to Colorado last year to free himself from addictions that grew out of the pharmaceuticals prescribed by the VA to treat his service-related physical and psychological injuries. Because Schwab is legally using medicinal cannabis in Colorado, officials in prohibitionist Kansas have abducted five of his children, ranging from 5 to 16 years of age. 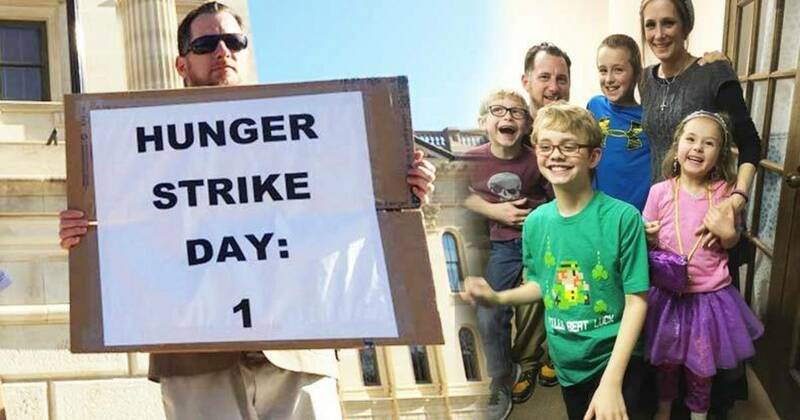 In an email to the Free Thought Project, Schwab tells us that he has begun a hunger strike until his children are returned. The strike began Monday and, according to Schwab, will continue until he is reunited with his children. Now, realizing Riley County Courts do not care about their oath of office, nor the Constitution or the law I will be on a hunger strike at the State Capitol until my children are returned, a Federal lawsuit or injunction is filed against you or those who have committed this crime are indicted. Some have said your State will not care, and they will let me starve to death. If that happens it will be on your doorstep, and my blood will be on your hands. Give me my children. “Greater love hath no man than this, that a man lay down his life for his friends.” – Jesus- Ms. Brownback said recently that Kansas DCF and foster care should be a model for the nation. God help us all if that ever becomes a reality. As Veterans for Medical Cannabis Access points out, medical cannabis is an effective treatment for veterans with post-traumatic stress disorder (PTSD), where other drugs fail. Veterans are successfully treating themselves despite the federal government’s prohibition. The ransom demanded by the Kansas “child protection” bureaucracy is a promise that Schwab will refrain from using cannabis, and four months of “clean” urinalysis test results. Last April, a child abuse investigation cleared Schwab of harming his children in any way. Yet a judge has ruled that the children will remain in state control until Schwab and his wife foreswear any further legal use of cannabis. Despite admitting that they have no grounds to keep the children because the charges are unsubstantiated, the DCF continues to hold their children hostage. In a statement to the Topeka Capitol-Journal, a DCF spokesperson confirmed that they need no evidence to kidnap a family’s children. The DCF’s declaration that 96 percent of all children they have kidnapped are being held on unsubstantiated charges is chilling and a testament to the arbitrary nature of their motives. To make matters worse, the Schwab’s 13-year-old son has been institutionalized against the family’s will. He is now being held in a state facility where he is being given psychotropic drugs and is expected to remain there for up to 60 days. The DCF has attempted to smear the family in the media by claiming that they are holding more information that can implicate the Schwab’s in abuse and claim the if Raymond would allow them to go public, the world would know. However, the Schwabs have repeatedly tried to view the documents themselves — but they have not been allowed. My wife and I are thankful that DCF is so committed to releasing the truth as we are. We also agree that there needs to be a level of privacy and safety for children concerning sensitive issues such as child abuse. I have released to the Topeka Capital Journal the findings from DCF that ALL allegations were unsubstantiated against us. Since DCF, District Attorney Barry Wilkerson, and Judge Bosch refuse to give me ALL documents pertaining to our case, even though I am representing myself, I cannot say what DCF claims we are hiding. We have never said this case is about Cannabis alone. It was based on false allegations of abuse, which the DCF report said were unsubstantiated, then told us that lack of substantiation meant nothing and we had to stop our legal Cannabis Therapy in our home State in order to even visit or get our children back. This we have done as we currently have visited our children after submitting clean UA’s. So this is about Cannabis. When I confronted Governor Brownback today and begged for my children back he stated that since the allegations were unsubstantiated we would get our children back. When I informed him that finding was issued in July of 2015 he said he could not control the courts and walked away. DCF claim my children are safer in their care, but they have been abused with multiple hotline report of sexual and physical abuse filed while in DCF custody. They are hiding the actual reports from us while telling us on the phone it did happen but they cannot give me details. Raymond’s hunger strike started on the 14th and the state has yet to respond. In what world is it considered acceptable to kidnap a family’s children, split them up, medicate them against their will, and allow them to be physically and sexually abused to protect them from their parents who’ve done none of these things? Former Gubernatorial candidate Jennifer Winn is on the side of the Schwab family and responded to their case in a statement on her Facebook page Wednesday. I am now the official power of attorney over Raymond and Amelia Schwabs children. I am hereby giving public notice to Governor Brownback, DCF, St. Francis, Judge Bosch and Pathway Family Services located at 4101 SW Martin Drive. Suite B. Topeka, Kansas 66609 you do NOT have the authority to medicate Raymond and Amelia Schwab’s 13 year old son Caleb Karl Schwab DOB-07-16-03 under any circumstance with mind altering drugs. Should you continue to force feed this child any mind altering medication, your company and ANY personnel performing this task will be in violation of my consent and you will be held accountable in a court of law. On Sunday, Raymond told the Free Thought Project that the records will be released Jennifer Winn. They said we are lying and if we signed a release to any citizen they would open the records to them. We signed a release to former gubernatorial candidate Jennifer Winn and will be going into DCF at 1:00 pm and hold a press conference after so she can report her findings. I stated to the press if she said we were lying I would stop the hunger strike. Here’s what you can do to help this family in need. The family has started a Facebook page to keep their supporters up to date. You can visit the Free the Schwab Children Facebook page here. Then you can contact everyone involved who continues to keep this family apart and peacefully let them know that what they are doing is wrong. Governor Brownback may be reached at 785-296-3232, or contacted here. He is also on Facebook and on Twitter.